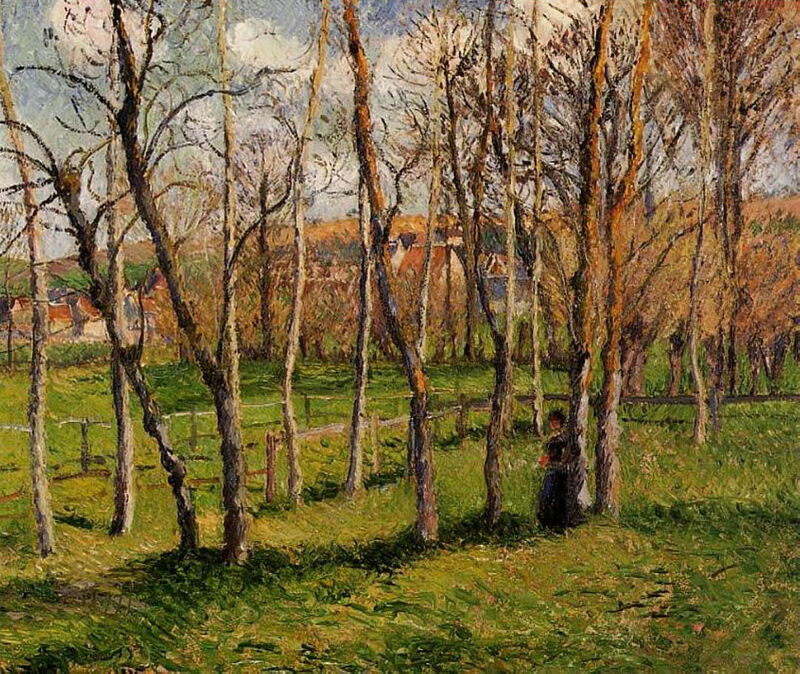 If you pick any painting by Pissarro, chances are that it will include trees. Not just a quick, symbolic lollipop stereotype of a tree either, but trees which more closely resemble the real qualities of trees than any other painter. As most of these trees were dashed off in the couple of hours during which light remained sufficiently constant for plein air painting, Pissarro’s innumerable trees are an artistic phenomenon in their own right. (Jacob Abraham) Camille Pissarro (1830-1903) was born and brought up on the Caribbean island of Saint Thomas, in a mixed Portuguese Jewish and Creole family, of Danish nationality. When at boarding school in France he showed himself to be an able artist, and at the age of 21 he travelled to Venezuela with friend and painter Fritz Melbye, where he worked as an artist for two years. In 1856 he moved to Paris, where he worked as assistant to Anton Melbye, Fritz’s successful artist brother. In Paris, he tried classes at the École des Beaux-Arts and the Académie Suisse, but settled with instruction from Corot. In 1859 he had his first painting accepted for the Salon. He travelled further afield, specialising in landscapes, and painting extensively plein air. He met Claude Monet and others who were, with him, to form the French Impressionists, and in 1863 was among those whose work was included in the Salon des Refusés. 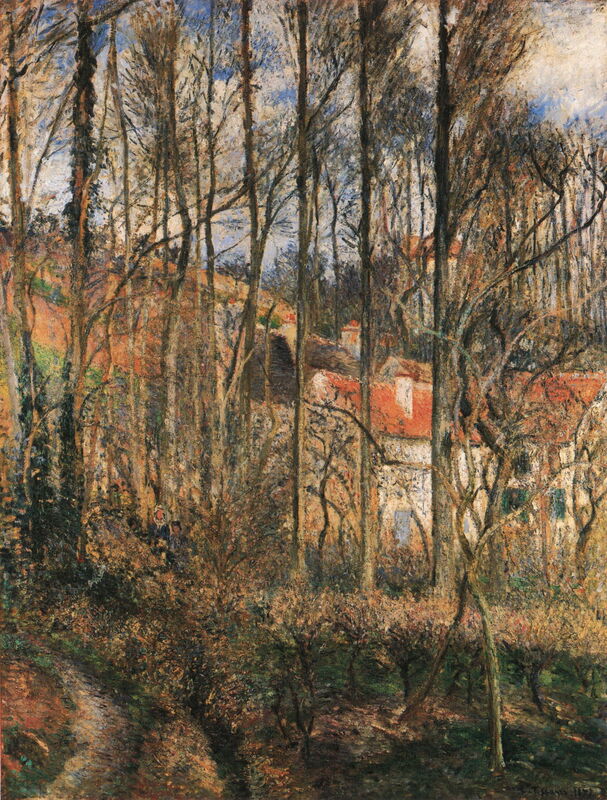 Pissarro married and settled first in Pontoise, then Louveciennes, outside Paris, where he painted in the local countryside. At the outbreak of the Franco-Prussian War in 1870, he fled with his family to Norwood, then an outer suburb of London. He met Paul Durand-Ruel, who became his dealer, and Monet (again), who had also fled to London. When he returned to France, he discovered that most of the 1500 or so paintings which he had left behind had been damaged or destroyed by soldiers who had occupied his house. In 1873 he was the central figure in the establishment of the French Impressionists, and was seen as their father figure. He was a prime mover in the First Impressionist Exhibition of 1874 too. He often painted in company with Paul Cézanne, who credited him with being his major mentor during his Impressionist period in northern France. During the 1880s he became more unsettled, spending periods painting rustic genre scenes, and becoming increasingly detached from his classic Impressionist style. 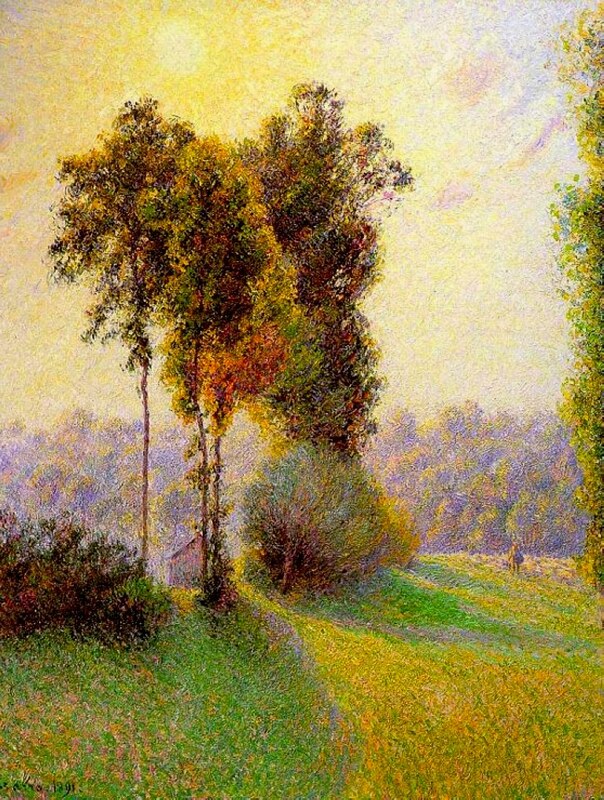 From 1885 to 1888 he became an overt Neo-Impressionist, alongside Seurat and Signac. This brought about a crisis in the Impressionist movement which did not resolve until he returned to its fold by 1890. On the advice of Monet, he then undertook campaigns of series paintings, most often in urban settings. He had also been experiencing problems with his eyes, which prevented him from painting in the cold. He thus found it better to remain in carefully chosen hotel rooms or apartments, where he could paint the same views in different seasons and lights. Much of his artistic career was spent in severe poverty, but he eventually enjoyed commercial success and recognition beyond the circle of Impressionists. However during the twentieth century his reputation, and importance in Impressionism, waned in favour of Monet. It is only in the last couple of decades that his importance has been re-discovered. Although most of Pissarro’s works prior to the Franco-Prussian War were destroyed during that war, some, including those which had been bought by Anton Melbye (the more successful artist brother of his friend and painting colleague Fritz Melbye), have survived. 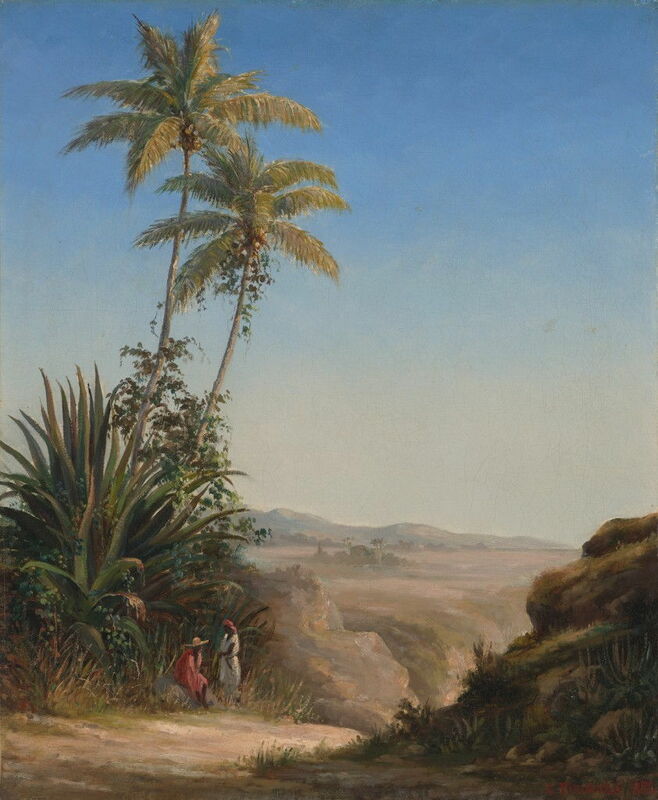 As early as 1854 he painted a tropical forest, and trees appear increasingly frequently in his early landscapes. From the outset, his approach to trees was thoroughly anatomical, and only in the briefest of sketches did he ever bulk in their canopies as a solid mass. 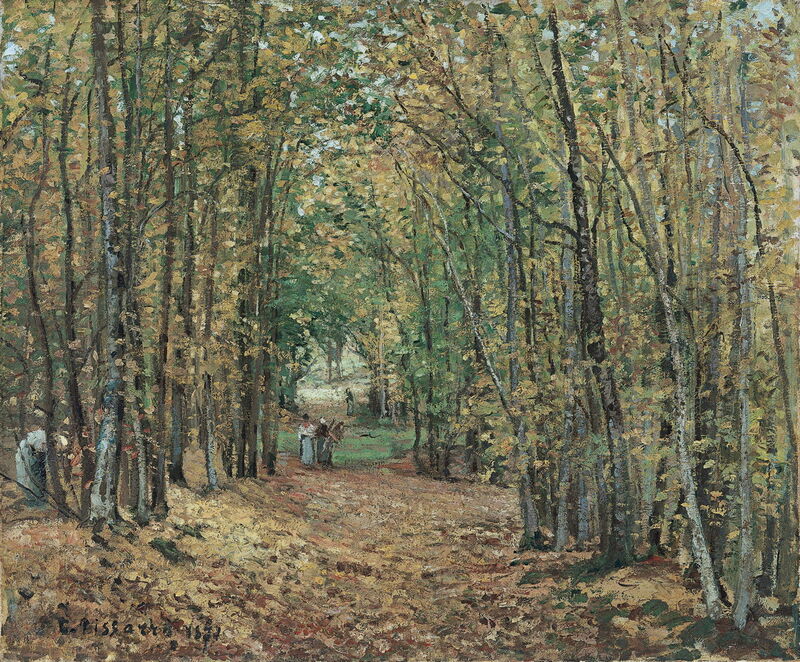 Camille Pissarro (1830-1903), Forest Path (c 1859), oil on canvas, 41 x 33 cm, Private collection. Wikimedia Commons. When he moved to France, he became an almost compulsive painter of trees. At first, when painting them around Paris in 1856, they were depicted quite sketchily, but as his Barbizon-like style developed the following year, he devoted much more time to their details. By 1862 he was painting his first road motifs featuring rows of tall poplars. 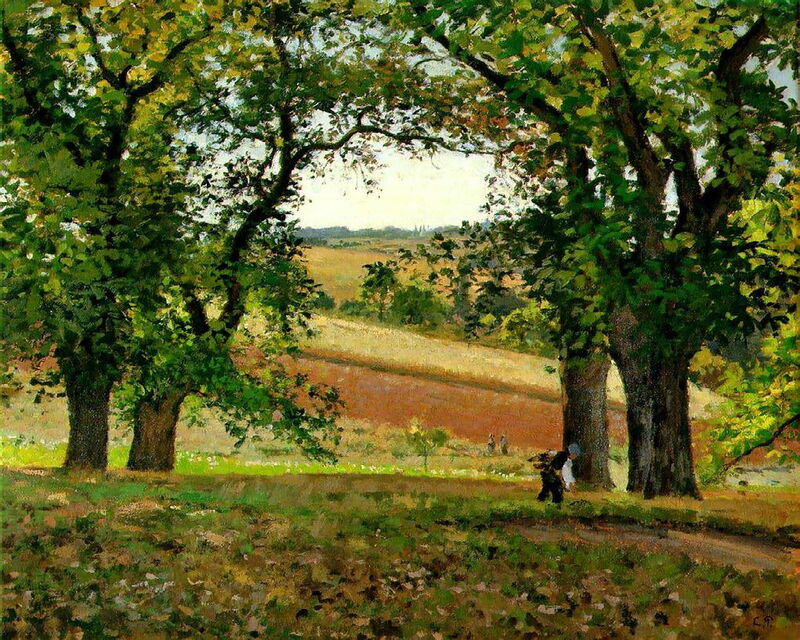 As many artists before him, Pissarro used trees to frame his motifs in repoussouir, but during the late 1860s they started to invade more central areas of the canvas. 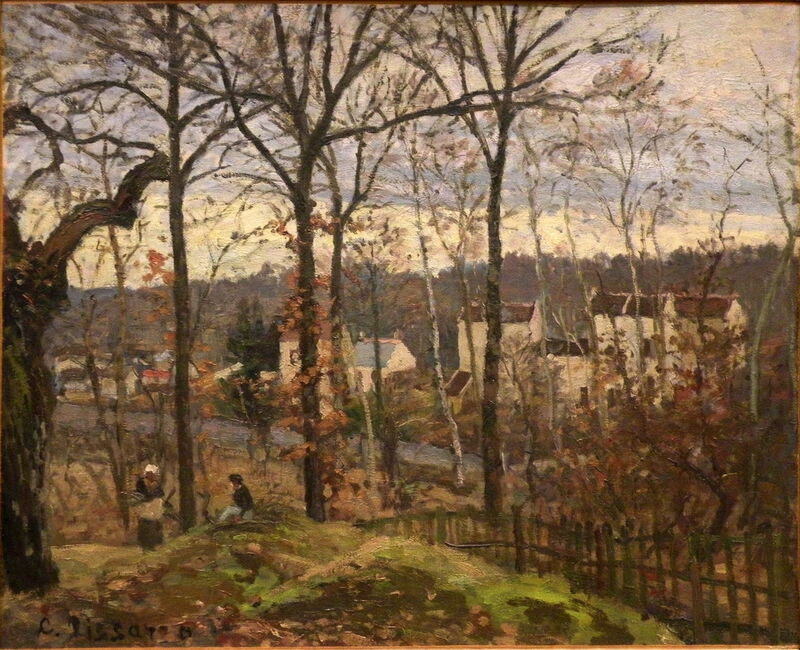 In about 1869, in his The Village Screened by Trees and Winter Landscape at Louveciennes, for the first time tree trunks and branches both exposed small sections of the motif behind, and hid that motif with their grillage (a term I will use here for this compositional technique). Camille Pissarro (1830-1903), Winter Landscape at Louveciennes (c 1869), oil on canvas, 37 x 46 cm, Musée d’Orsay, Paris. EHN & DIJ Oakley. Although grillage dates back at least to Corot’s Castel Gandolfo (c 1826), it is something characteristic of Pissarro which was later taken up by other artists: Monet’s Bordighera (1884) is a restrained example, Cézanne used it severally, and modern artists such as Peter Doig – most notably in his Architect’s Home in the Ravine (1991) – continue to use it to great effect. 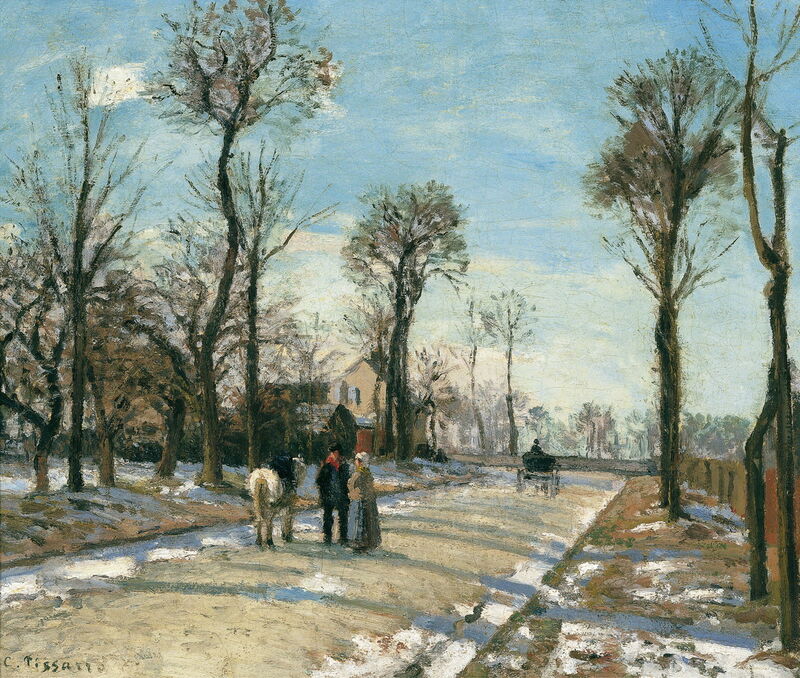 That same year, 1869, his winter paintings concentrated on road scenes, with attendant trees, around Louveciennes, a theme which continued for many years, spanning the seasons. The following year his rushed and more sketchy trees resolved into finer and more subtle representations, as he started to use brighter colours too. 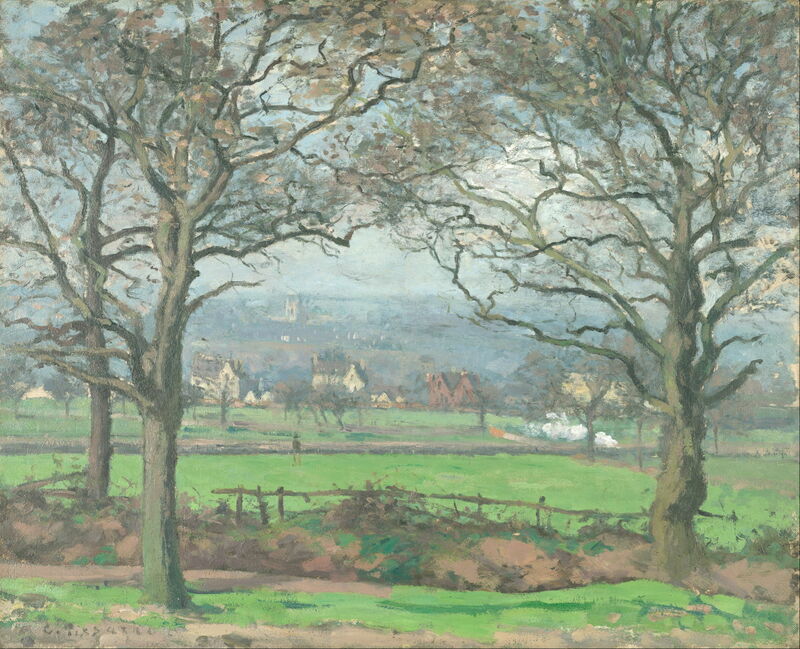 Camille Pissarro (1830-1903), View of Alleyn Park, West Dulwich (c 1871), oil on canvas, 43.5 x 53.5 cm, Kimbell Art Museum, Fort Worth, TX. Wikimedia Commons. This steady torrent of landscapes with trees eased in 1874, when he painted several fine portraits and concentrated on rustic genre scenes too. 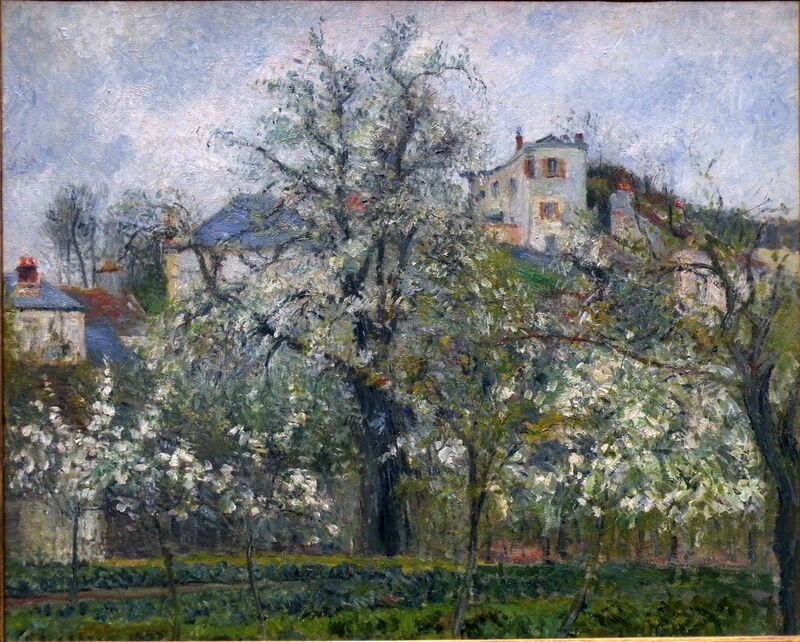 But by 1877 the trees were back in full spate, with a couple of remarkable grillage paintings featuring pear trees in flower, and almost occluding the motif behind. Camille Pissarro (1830-1903), The Jardin de Maubuisson, Pontoise, Spring (1877), oil on canvas, 65 x 81 cm, Musée d’Orsay, Paris. EHN & DIJ Oakley. Camille Pissarro, Cows Watering in The Pond at Montfoucault (1875), oil on canvas, 73.6 x 92.7 cm, Barber Institute of Fine Arts, Birmingham. WikiArt. 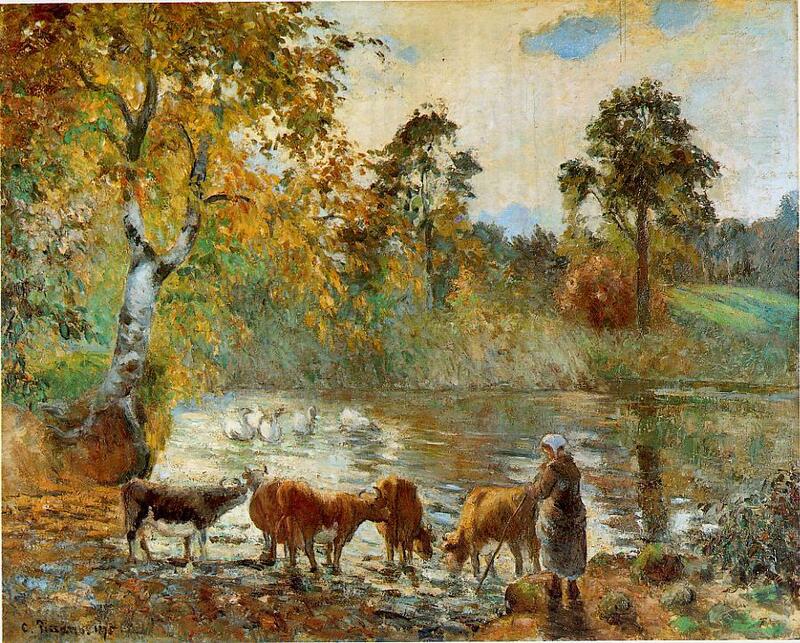 Cows Watering in The Pond at Montfoucault (1875) is one of a pair of paintings, this one painted plein air, the other a studio version. 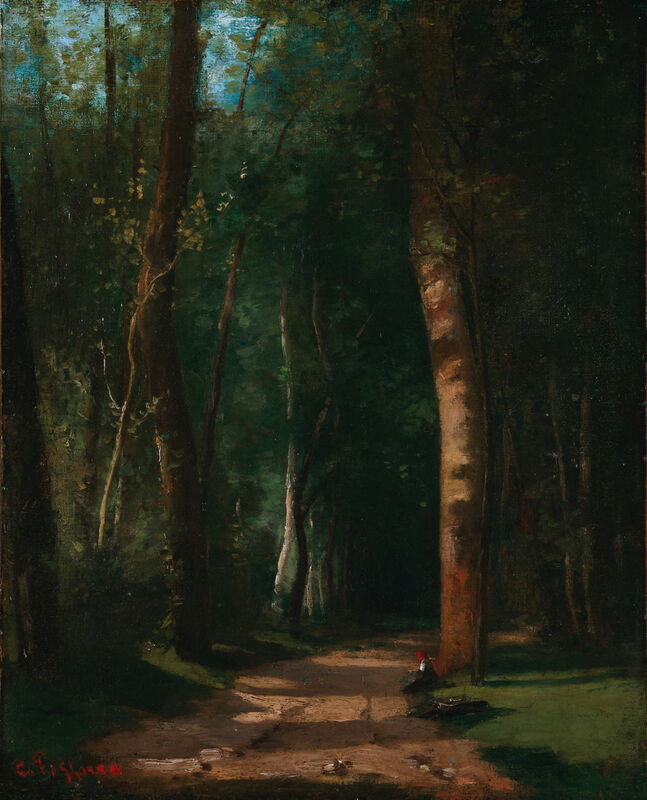 Its subject and composition are typical of some of the works of Corot, as a pastoral landscape rich in trees. Around 1879 he hid/revealed Pontoise using grillage, as his brushstrokes became ever finer. During the 1880s the latter became increasingly Divisionist in form, paralleling Seurat’s development of first chromoluminarism then Neo-Impressionism. From about 1883, this was accompanied by a marked increase in both brightness and chroma in his work. His landscapes eased again when he painted an urban series in Rouen. 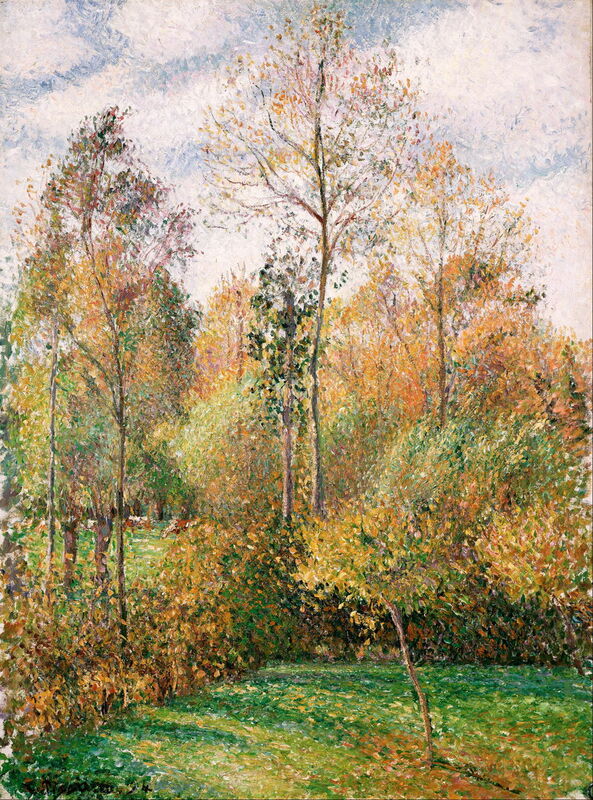 Once Pissarro settled at Éragny in 1884, his depictions of trees settled into a more consistent and mature style, with trunk, branches, and canopy constructed from generally fine brushstrokes, using bright, rich colour. Even quite dense canopies were painted in this way, producing some of the most textured and leafy foliage of the day. When sketching quickly in oils, his brushstrokes became coarser, and they started to orientate into swirls and whorls which resemble those of Vincent van Gogh. In the late 1880s these fine strokes became increasingly Pointillist, until he was a de facto Neo-Impressionist. He painted many hundreds of landscapes in and around Éragny, showing every subtlety of season, time of day, and light. There were some interruptions: the occasional run of rustic genre scenes, a few nudes bathing in wooded surroundings, and in 1890 a return visit to London, although even there he found more trees to paint. 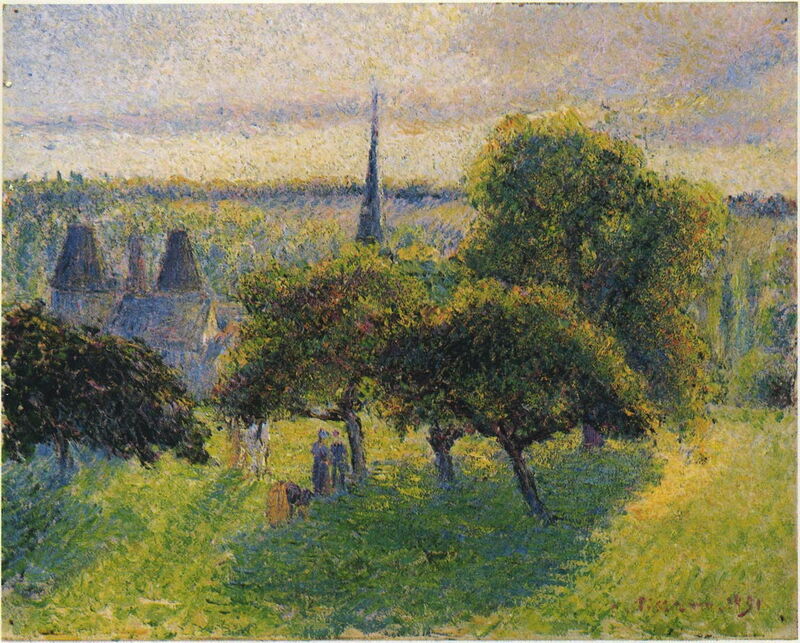 Camille Pissarro, Landscape at Saint-Charles, Sunset (1891), oil on canvas, 80.9 x 64.9 cm, Clark Art Institute, Williamstown, MA. WikiArt. By 1890 his experiments with brushstrokes had moved in the other direction, and trees (as with the rest of the painting) were built from much coarser strokes, as some of his early oil sketches had been. When he started painting urban series in 1893, once he returned to his beloved Éragny he continued ferociously painting landscapes with trees. Camille Pissarro (1830–1903), Autumn, Poplars, Éragny (1894), oil on canvas, 81.4 x 60.6 cm, Denver Art Museum, Denver, CO. Wikimedia Commons. He returned to grillage periodically, too: one interesting run appeared in the winter of 1895, for example. But in the years after that, when he was more restricted to painting indoors, particularly during colder weather, he produced fewer rural landscapes, and many more urban ones. This still gave him the opportunity to include trees, for example in the Boulevard Montmartre, the Tuileries Gardens, and around the Louvre. But there was now only a sporadic trickle of works showing the country around Éragny. 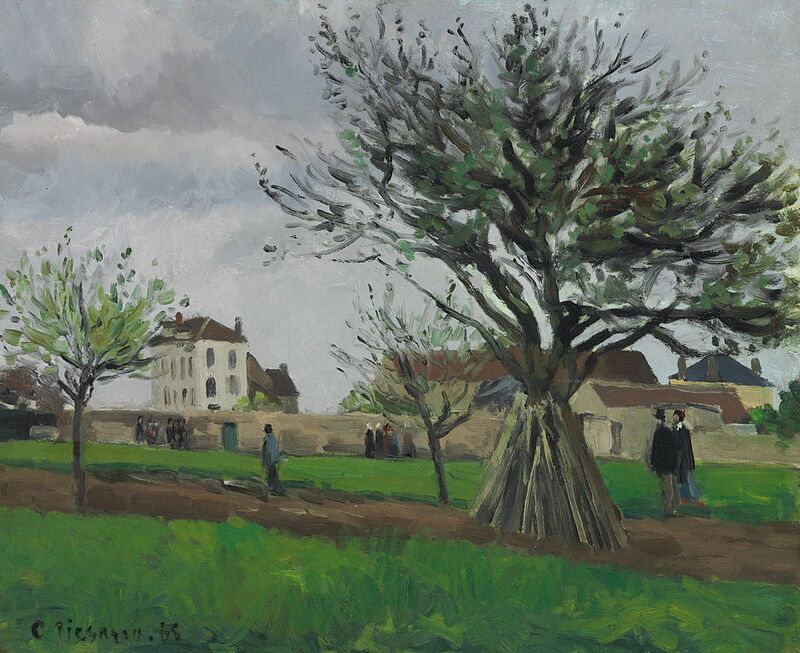 Among his last tree paintings was his fourth series of urban landscapes around Pont-Royal in the spring of 1903, in which the trees, just coming into leaf, encroach from traditional locations at the edges, until they meet in his characteristic grillage. 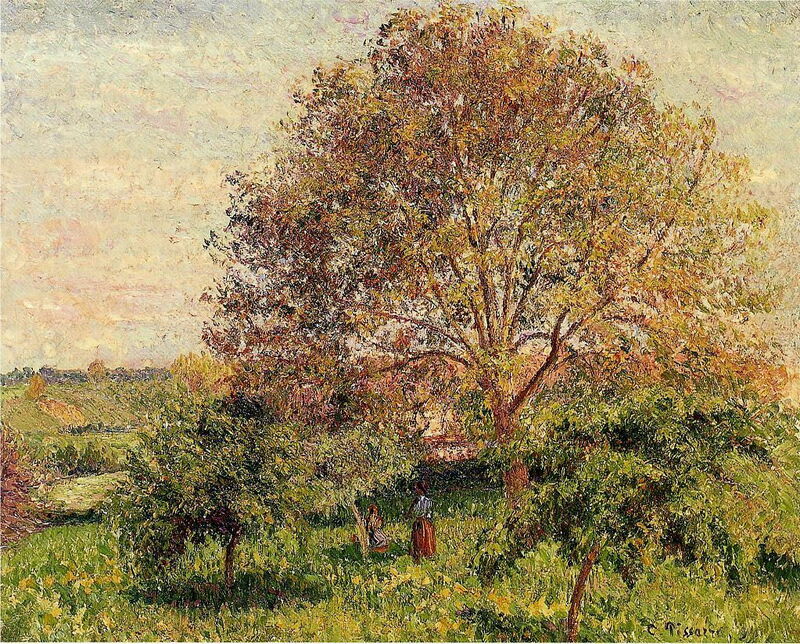 Pissarro relayed painting style – particularly that used to depict trees – from realism, through the Barbizon School, to Impressionism, Neo-Impressionism, and Post-Impressionism. Although he continued the tradition handed to him by Corot, and stemming back to Valenciennes, he developed his own style which evolved throughout his long career. Although not the first to paint grillages, he used this unusual technique for more than thirty years, more than any painter before or since. In this, and many other matters, he was a major influence on Paul Cézanne, Vincent van Gogh, and was the senior Impressionist. Pissarro’s long and compulsively creative career was founded and centred on his depiction of trees. All who followed him have done so in that tradition. Brettell RR (1990) Pissarro and Pontoise, Yale UP and Guild. ISBN 978 0 300 04336 5. Pissarro J (1993) Pissarro, Pavilion Books and Harry N Abrams. ISBN 1 85793 124 6. Pissarro J and Snollaerts CD-R (2005) Pissarro. Critical Catalogue of Paintings, 3 vols, Wildenstein Institute and Skira. ISBN 88 7624 525 1. Rothkopf K ed (2006) Pissarro. Creating the Impressionist Landscape, Philip Wilson, London. ISBN 0 85667 630 6. Posted in General, Painting and tagged Barbizon, Cézanne, Corot, Durand-Ruel, grillage, Impressionism, landscape, Melbye, Michallon, Monet, painting, Pissarro, plein air, trees. Bookmark the permalink. Apologies for the slight glitch in captioning in one of the paintings above: I have fixed that now.